German Talmudist of the middle of the sixteenth century; rabbi at Sulzburg, near Freiburg in Baden [?]. He was classed among the best Talmudic authorities in Germany. Among his pupils Joseph B. Isaac ha-Levi Ashkenazi was proud to have had Blum for his master (see his epistle against Meïr b. Gedaliah reprinted in Zunz, "'Ir ha-Ẓedeḳ," note 35). Blum copied and compiled various works. The city library of Hamburg contains a copy of the "Niẓẓaḥon" and a collection of "sheṭarot" (documents) marked as copied by him. 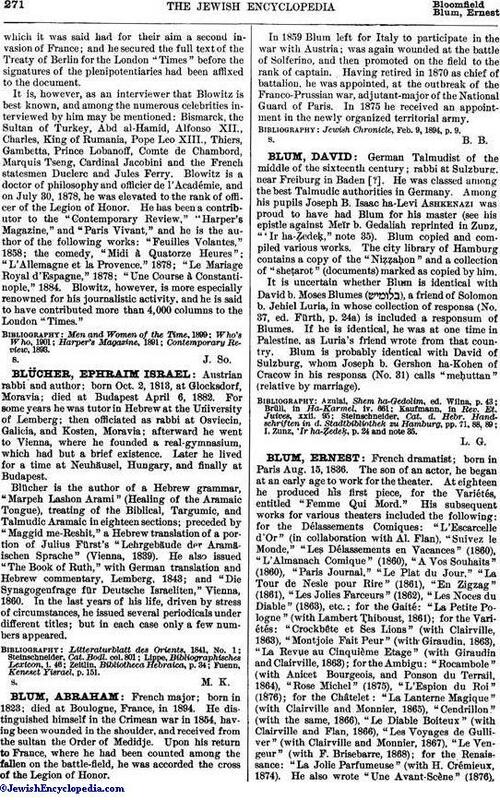 It is uncertain whether Blum is identical with David b. Moses Blumes ( ), a friend of Solomon b. Jehiel Luria, in whose collection of responsa (No. 37, ed. Fürth, p. 24a) is included a responsum of Blumes. If he is identical, he was at one time in Palestine, as Luria's friend wrote from that country. Blum is probably identical with David of Sulzburg, whom Joseph b. Gershon ha-Kohen of Cracow in his responsa (No. 31) calls "meḥuttan" (relative by marriage). I. Zunz, 'Ir ha-Ẓedeḳ, p. 24 and note 35.